Get set for the Second Annual Rockabilly Reunion this weekend February 12-14, 2010. 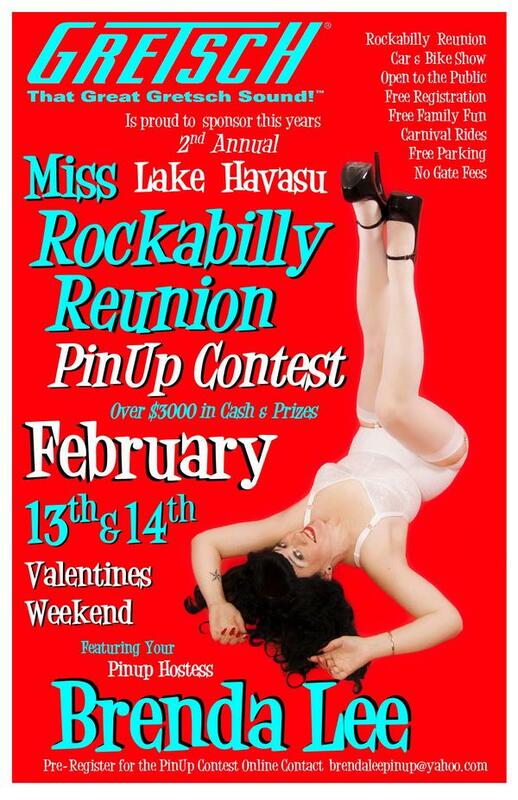 How often can you get Rockabilly music, a pinup model contest and Rockabilly music all for FREE for you and your ride? Voodoo Swing is set to perform at the event held on the shores of the Colorado River at Windsor State Beach in Lake Havasu, Arizona. “We’re thrilled to be playing three days of music along with other great acts for some of the biggest rockabilly music fans in the country who truly appreciate what we do”, said Voodoo Swing’s front man Paul “Shorty” Kreutz. The Rockabilly Reunion is free to spectators of all ages and there is no charge to enter a car for display. Voodoo Swing plays throughout the weekend along with multiple rockabilly acts. The band is scheduled to play a welcome party at Nautical Inn Resort on the island at the beach in Lake Havasu City at 9pm on Friday evening following the poker run held at Windsor State Beach in Lake Havasu City on both Saturday and Sunday. Carnival rides for all ages will be in place throughout the weekend. Additional features include the annual pinup contest, beer and food garden, vendor corral, used parts swap meet, used car corral and pin striping contest. A Brian Setzer Series Hotrod Gretsch guitar will be auctioned off during the weekend. The guitar has been provided by event sponsor Gretsch and can be viewed at the Gretsch booth near the stage. A portion of proceeds from the high bid will be donated to America Home Dream, a non-profit organization that assists families of children with cancer. For the Pinup model contest sponsored by Gretsch guitar, there’s $3000 in prizes available so get in touch with moc.oohaynull@punipeeladnerb to enter. Vintage TorqueFest 2014 — Dubuque, Iowa Fairgrounds May 2 – 4 Hot Rods Driven Hard… The Way It Was Intended!! Retro Rewind 2014 – Hot Cars, Hot Music, Hot Times! Retro Rewind 2014–We Can’t Do This Without Pinups! I`m a fan of Stray Cats and Rockabilly in general and of course the Pin-ups. Click here to sign-up today! 1956 Ford F100 – Dual Hemi’s Just in Case He Needs to Pass! John Force Racing Between Rounds – Fire in the Hole!